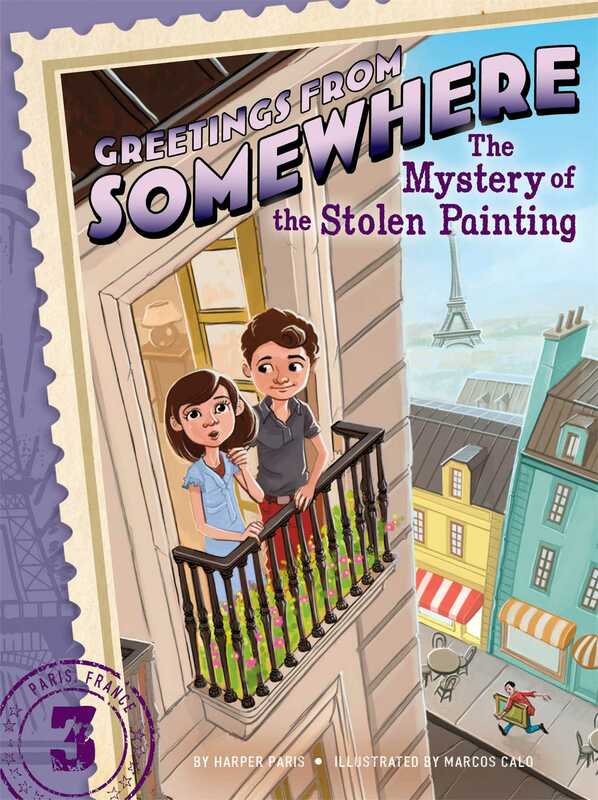 Excited to be in Paris, Ethan and Ella are on the hunt for a secret bakery and a stolen painting in the third book of Greetings from Somewhere, a chapter book series about mystery, travel, and adventure. Ethan and Ella are excited to get to Paris—they’ve only ever seen pictures of the Eiffel Tower! After arriving, the twins receive an email from their beloved Grandpa Harry. He tells them that there’s a secret bakery near the Louvre museum—so secret, in fact, that you need a password to get inside. Lucky for the twins, their dad wants to take them to see some artwork at the Louvre. But while they’re browsing paintings at the museum, alarms suddenly go off, the building is evacuated, and tons of police show up outside. A painting has been stolen! And Ethan and Ella are on the case! Can they manage to find the stolen painting and the secret bakery without giving themselves away? Ella Briar gazed out the airplane window. Down below, miles of glittering lights twinkled against the evening sky. “Look, Ethan!” she said to her twin brother. “I think that’s the Eiffel Tower,” Ella said, pointing. “I see a river!” Ethan announced. Fun shops? A famous museum? The twins couldn’t wait! A short while later, their plane landed at the airport. The Briars took a taxi to the apartment they were renting. The building had no elevator, so they had to carry their suitcases up five flights of marble stairs. They were out of breath by the time they got to the top. The climb was worth it, though. The apartment was enormous, with an elegant balcony that overlooked red rooftops and bustling cafés. Brightly lit boats cruised along the river. In the distance, the Eiffel Tower shimmered like a gold jewel. Ella remembered from her dad’s guidebook that Paris was often called the City of Light. Now she knew why! Ethan ran straight to the biggest bedroom. “Dibs!” he shouted. “Hey, not fair!” Ella protested. Ella loved books, and purple was her favorite color! She raced down the hallway with her suitcase and found her room. It had a canopy bed with a lavender bedspread. Black-and-white photographs of Paris covered the walls.